Carnfunnock Country Park is packed full of attractions and activities for all ages. From our Walled Garden, Ice House and Motte to our walking trails and Maze with 1,500 trees; there is something for all. For peace and tranquillity visit our beautiful Walled Garden with its distinctive sundials and unique wooden sculptures. Its vast range of exotic plants and trees are an inspiration to any gardening enthusiast or anyone simply wanting to relax! It also provides a wonderful setting for wedding / civil partnership ceremonies or photographs and summer band concerts, as well as providing an excellent Educational resource. Nothing quite complements a summer's afternoon in the walled garden more than listening to the relaxing sound of a rippling fountain in the pond or watching fish rise gently to take advantage of an unwary insect. Some of the aquatic plants worth noting here are: Nymphaea Gladstoniana (Water lily) and Iris Siberica (Marginal water plant). The presence of stone here is an advantage to some of the plants as the rocks retain the suns heat and release it slowly during the night, providing protection from frost and maintaining a relatively warm pocket in the garden for unusual plants to grow. Some of the plants worth noting here are:- Sedum Sathulifoliun (Cape Blanco), and Iberis Sempervirens. The heather plant beds are elevated above the surrounding area to allow maximum sunlight to penetrate, aid drainage and display the plants to their best advantage. The beds have been planted to ensure all-year round interest, but are at their best during summer and autumn. Some of the plants worth noting here are:- Calluna Vulgaris (Gold Haze) and Erica Carnea (Springwood White). The Time Garden tells the story of time not only in terms of the sundials but through the different seasons. If you imagine this garden as a living clock face then spring starts at 12 O'Clock through to 3 O'Clock, Summer is 3 O'Clock to 6 O'Clock, Autumn 6 O'Clock to 9 O'Clock and Winter 9 O'Clock to 12 O'Clock. The various plants and shrubs planted in these sectors flower in their respective season. Some of the plants worth noting here are:- Enkianthus Campanulatus, Camelia Japonica (Alba Simplex). For further information on our sundials please download the Sun Dials at Carnfunnock leaflet below. Further examples of human sundials can be viewed at Sun Clocks website. A central pathway leads the visitor into this quiet, reflective place which has been designed to have interesting flowers and foliage throughout the seasons. The flower garden is laid out in a repeating pattern, in precise patterns with delightful colour combinations. Some of the plants worth noting here include a wide variety of annuals and bi-annuals, which interchange each season. From the flower garden follow the scented walk, where the visually impaired may enjoy the wonders of the garden, as you do not always have to see a flower to appreciate its beauty. Just close your eyes and take in the barrage of scent from the various plants. Some of the plants worth noting here are: Choisya Ternata, Osmanthus X Burkwoodii, Lavandula Angustifolia (Hidcote). This area has been planted with flowers / shrubs that produce high levels of nectar, which is food for butterflies. While its name suggests that this area is for butterflies, it also attracts the humble bumble bee which also relies on nectar. Some of the plants worth noting here are: Buddleia Globosa; Syringa Vulgaris 'Massena' (Lilac). The long herbaceous border, with its sheltering brick wall and mounted blue sundials has a variety of species and varieties. Plants of note include: Iris Intermedia 'Raspberry Blush'; Polemonium Brise d' Anjou; Papaver Orientale 'Choir Boy'; Aster Frikartii 'Monch' and lots of other colourful flowering plants. In 1985 a province wide competition was organised entitled ‘Design a Maze’. What you see today is based on the winning idea - a unique hedge maze in the shape of Northern Ireland. It has numerous paths and dead ends with seven central spaces, one for each county and one for Lough Neagh. 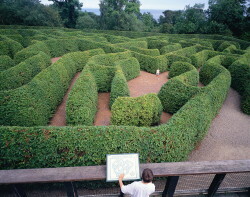 The maze was planted out in 1986 with a variety of hornbeam called Carpinus Betulus - over 1,500 mature plants were used! By 1991 it was well established for its official opening, to mark Northern Ireland’s contribution to the International Year of the Maze. Hornbeam can live for up to 150 years and we hope the Carnfunnock maze will continue to fascinate, entertain and bewilder all ages for many, many years to come. Click here to learn more about the Carnfunnock Maze and its use as an educational resource. Distance: 1.3 km / 0.8 miles. Time: 20 minutes approx. This gentle walk explores the park's unique hornbeam maze, tranquil and colourful walled garden and includes a walk to the fun filled activity centre. Not suitable for dogs. Distance: 2.6 km / 1.6 miles. Time: 35 minutes approx. This historic walk takes in some of the original estate features including the walled garden (originally the estate's kitchen garden), the ice house, a late 12th century Norman motte and the lime kilns. Not suitable for dogs. Distance: 2.4 km / 1.5 miles. Time: 30 minutes approx. This relaxing walk passes by the activity centre and family fun zone taking you through woodland to the outskirts of the park and along the shoreline to Drains Bay. Here you can enjoy a stroll on the beach and catch a glimpse of boats sailing on the North Channel. Distance: 4.0km / 2.5 miles. Time: 60 minutes approx. This pleasant woodland walk takes in most of the park's features and includes an energetic trek to the wildlife garden and the woodlands at the upper end of the Park, where you might discover signs of native wildlife. Take care on the slopes and steps. Distance: 1 km / 0.6 miles. Time: 20 minutes approx. The circular route is accessible for wheelchair users and families with young children in buggies. It extends around agricultural land and offers scenic views of the Antrim Coast Road and Carnfunnock Bay. Along the route, you will see a number of unique habitats, which have been created specially to enhance the park’s biodiversity and encourage wildlife. In particular there is a giant bird table, bog garden and tree, shrub and wildflower areas. Look out for various plants, animals, birds, insects and even fungi, which make up our native biodiversity. This project has been supported by Northern Ireland Environment Agency under the Department for Agriculture, Environment and Rural Affairs. Our two stone kilns were built in the early 1800s in order to burn lime. The lime was produced from the former quarry that was located between the kilns. Lime burning could take up to four days. The kilns were therefore built as a pair so that one could be kept going while the other was being emptied. By the early 1900s they were defunct and lime for the estate was purchased from Kilwaughter lime works, which is situated south of Larne. Limestone, which is plentiful in the Antrim Coast and Glens, was formed over 100 million years ago from the remains of tiny shells and micro-skeletons deposited on the sea bed. These remains eventually formed solid rock. In the 18th and 19th centuries, numerous limestone quarries and kilns prospered locally, producing lime for agricultural and construction purposes. With the increasing use of cement, crushed limestone and artificial fertilisers, the quarries and kilns have not functioned for a long time. How does a lime kiln work? 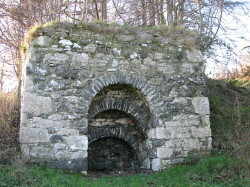 The first stage in preparing this type of kiln was to light a coal fire at the base of the shaft. Alternating layers of coal and limestone pieces were then tipped into the ‘charge hole’ at the top. Once the fire was lit and the fuel started to burn, there was no need for the bottom fire. It would keep slowly burning day after day with temperatures reaching over 900oC. As the powdery mixture, known as quicklime, dropped through the grate into the ‘draw hole’ it was raked out and bagged. Further layers of coal and limestone were added at the top to allow continuous burning. The arched opening, known as the ‘kiln eye’, allowed air to feed the fire, prevented the hot quicklime from being blown around and protected it from the rain. There was also a poking hole to ensure the lime fell to the bottom. Producing lime this way was time consuming, dangerous and labour intensive. The material was corrosive and many workers suffered chemical burns from handling it or went blind if it entered their eyes. The fumes created by the burning process were often overpowering. What was the lime used for? Kilns were used mainly during the spring and summer when they would burn day and night. The quicklime was spread over the land to neutralise the acidity of peaty soil for growing better crops and improving yields. It was also the primary ingredient in lime mortar and white wash for buildings. 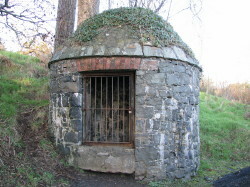 This building was constructed in the mid-1800s to store ice for Cairncastle Lodge. It was built into the hill and would originally have been covered completely with earth and vegetation to keep it cool and dry. The circular ice chamber is designed like a well. Originally there would have been a solid door, instead of the gate you see today. There would also have been a passage out to an external door. The double doors would have prevented warm air entering from outside. Servants would have been lowered down into the chamber by rope or ladder to create the ice mass and also to remove the ice for transportation to the kitchen. The building's thick walls are of basalt and other locally derived stone which insulates it and keeps it cool inside. Even in high summer, the stone is cold to the touch. What is an ice house? The use of ice for keeping food fresh is an ancient practice, although in Europe, ice houses did not exist until the early 1600s. They were built to store ice for use in drinks, cold dishes and to preserve fish, meat, poultry and dairy products. With the development of refrigeration and the year - round availability of imported commercial ice in the later 1800s, domestic ice houses gradually fell out of use. During the winter months, ice was collected from ponds and streams and placed in the chamber. The ice was broken up to create one deep ice mass. Thick stone walls, an earth covered roof, and insulating materials, such as straw placed over the ice, ensured that it lasted well into the summer. A drain at the base of the chamber kept the ice free of melt water as moisture melts ice as quickly as heat. Food was sometimes stored in the chamber, over the ice. This special motte was built in the late twelfth century and was used to control the surrounding land around Carnfunnock. From the watchtower the garrison had a commanding view over the Irish Sea and Coastal strip as well as towards the Antrim Plateau. The motte is located within agricultural land so please follow the countryside code as livestock may be present. Castles were built by the Normans as a defence against the Native Irish. 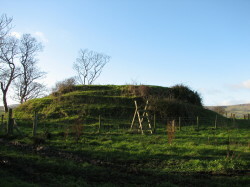 The first known castles were earth mounds called mottes. These were built as frontier posts in defensive positions to give a clear field of vision all around the castle. These earth mounds were surrounded by a ditch from which the mound material was excavated. Mottes often had a wooden watchtower surrounded by protective fencing of stone or timber. The tower served as an observation post and as a safe position for archers to mount a defence. They sometimes had an area called a "bailey" extending from the base of the mound where they lived, maintained stores and kept horses. This site is scheduled under the Historic Monuments and Archaeological Objects (NI) Order 1995 and is monitored by the Department for Communities Northern Ireland.